I am very much ashamed to say that when I first wrote about this church in the summer of 2002, I was led into temptation to mess about a bit. 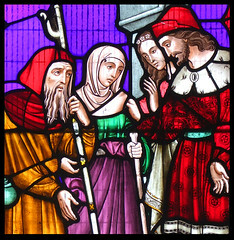 It was something like the 300th church on the site, and I'd discussed with a journalist friend the dangers of the site becoming formulaic, a listing of external and internal features, the occasional photograph. This was in the days before I embraced digital photography, of course. He suggested, as a joke, that perhaps I could try writing them in the style of different authors, and we settled on a list of James Joyce, Marcel Proust, Ernest Hemingway and Micky Spillane as the writers with styles most easy to replicate. Well, Hemingway and Spillane never got done, but Joyce and Proust did. St Mary's was the Joyce entry, although it would be truer to say that it was a pastiche of his 1916 work Ulysses. 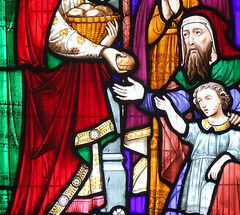 I thought it would be a harmless piece of fun, given that St Mary is redundant so the parish were unlikely to be offended, and in any case I didn't think anyone actually read what I wrote. As it turned out, I was wrong. They did. 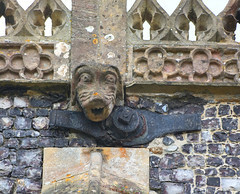 Lots of people contacted me about it, but as the response, on the whole, was positive, I left it, and left it, meaning to go back to St Mary and rewrite it after I acquired a digital camera in 2003. Unfortunately, it has taken until 2016 for me to make that journey. Sorry, Bungay. Sorry, Joyce. 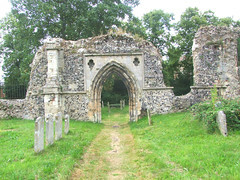 St Mary is quite the grandest redundant medieval church in Suffolk. The tower, of 1475, is one of the most spectacular Perpendicular moments in a county not short of them. 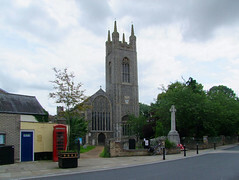 What remains to the east of it was the parochial nave of a Benedictine convent established in Bungay in the late 12th Century. 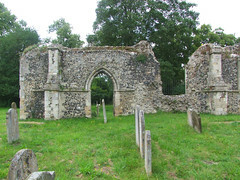 The ruins beyond were conventual buildings, including the nun's choir which stood to the east of the nave. 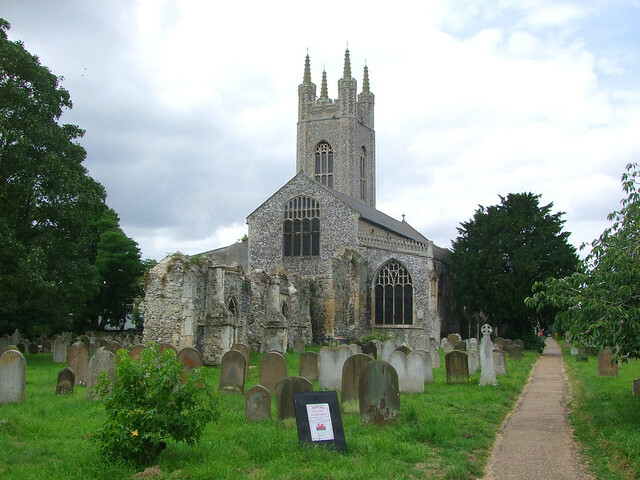 At the dissolution it became the parish church, but was gutted in the great Bungay fire of 1688. 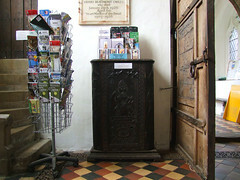 Thus, the interior is entirely post-Reformation in content and character. 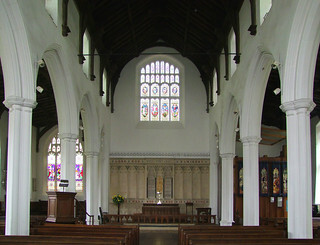 There were successive 19th Century restorations, one led by Thomas Jekyll as at neighbouring Holy Trinity, another later in the century by that safe pair of hands Richard Phipson, the diocesan architect. 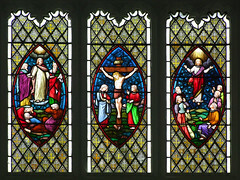 Because of this, interest in the interior rests largely on two things, the civic memorials and the 19th Century glass, both very good of their kind. 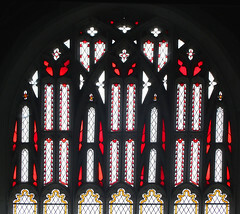 Jekyll's restoration saw the installation of windows by Charles and Alexander Gibbs. 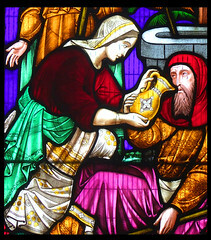 Unfortunately, that in the west window has not survived other than Alexander Gibbs's typically fizzy orange lozenges in the tracery of the upper lights. 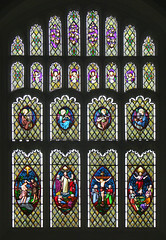 But the east window of the north aisle does survive, and depicts the Works of Mercy. 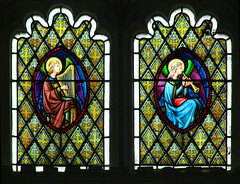 If the Gibbs brothers' work in the north aisle is vibrant, the east window is restrained and elegant. 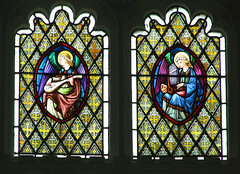 It is a window of two halves, the upper lights featuring Powell & Sons' jolly angels, the lower lights four scenes in the Life of Christ and more angels by Thomas Baillie. 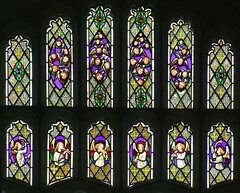 Presumably Baillie was also responsible for setting the Powell angels in the flowery quarries used in his own window. The memorials include the Norwich sculptor Thomas Rawlins the Younger's elegant 1760 monument for Henry Williams; a monument to Pergrina Browne by Rawlins's father as well as several other monuments of the 18th century, mostly by Norwich workshops. 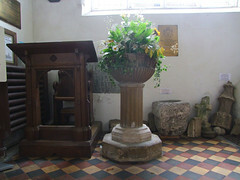 The only other furnishings of interest are an 18th Century font, installed here as at Holy Trinity after the fire, and a dole cupboard of 1675 signed with a rebus, the letter Q and a rat, to show it was given by a curate. It may not have come from here originally, as the initials of the man do not match anything in the records here. An interior and an exterior of different significances then. 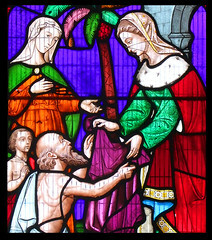 Internally it is not a dull church, but St Mary's great glory is of course its exterior, as at St Michael in neighbouring Beccles which also suffered a serious fire. Here, there are plenty of details to spot and wonder at. 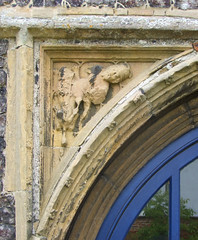 What, for example, do you make of the reliefs in the spandrels of the north porch? 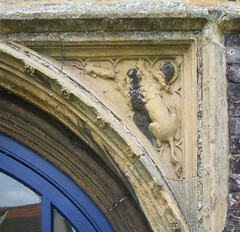 One appears to show a lion and a man - is he killing the lion, or is the lion eating him? The other, in some ways more mysterious, shows a lion with a cat, or possibly a lion cub. 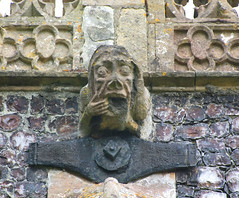 There are several excellent grotesques along the north side of the building, including one man holding his mouth open as if suffereing an attack of toothache, and at the north east corner is a man kneeling to pray, but apparently supporting the building on his back - a patron, perhaps? 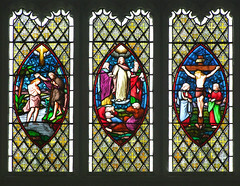 So there we are, I went back to St Mary at last, and I can put that Joyce pastiche to rest, although you can still read the text (though not the photographs that went with it) here. And the Proust entry? Well, you'll just have to find it.